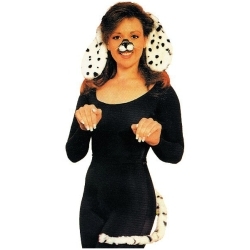 The dalmatian dog costume kit is the perfect place to start in creating a dalmatian costume. This kit is perfect for a quick and easy dalmatian costume, directors who are doing “101 Dalmatians” and for firehouses. Kit includes a pair of dalmatian ears on a headband and a matching dalmatian print tail.